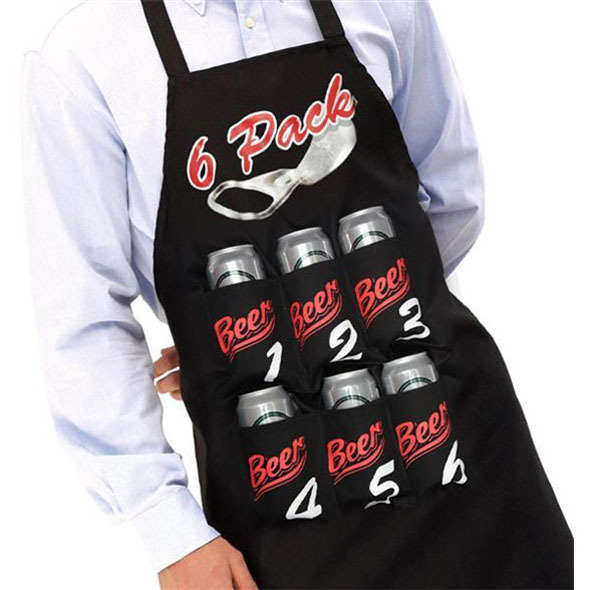 The 6 pack Apron is an absolute essential for the kitchen! When you invite your friends round for dinner, you can easily offer them a beer as you carry them around in your macho apron! What a great gift idea, why not buy this cool cooking gadget for a macho member in the family who loves to cook? Could this be the most convenient cooking apron ever?! Slaving away at the barbecue on a hot summer’s day, how refreshing would it be to have a load of your favourite canned drinks to hand in an instant? This novel apron allows you to live that dream – with six numbered and labelled pockets providing the space and support to hold all the cans you need! Black with red, white and silver print, the 6-Pack Apron features a large ring-pull motif on the chest - just in case you forget what to do! When taking on the role of chef, don’t just carry the can – carry six! Your macho buddies will soon discover that you have the 6-Pack that matters!